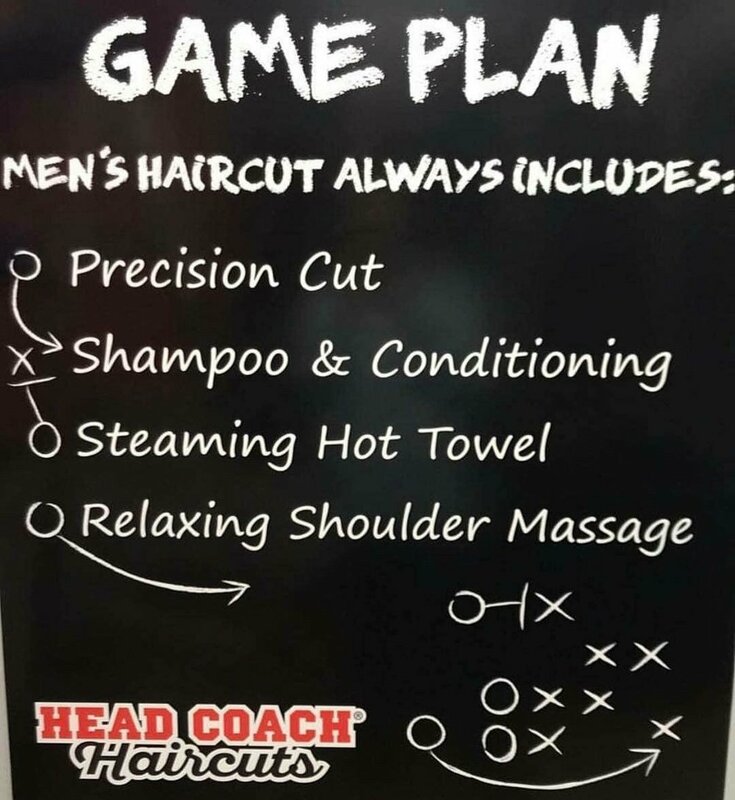 Head Coach is a sports-themed hair salon with locations in Greenville, Taylors and Simpsonville. Our adult male clients receive a relaxing shoulder massage, steamed hot towel, and massaging shampoo and conditioner. Head Coach provides barber services at ourFairview Road location. Come by and see one of our Master Hair Care Specialists who offer straight razor neck and head shaves. Head Coach is a sports-themed shop designed with the sports enthusiast in mind. You will enjoy the flat screen television in the lobby and won't miss a single play while getting your cut and/or shave. Each styling station has its own private tv so that you can continue watching the game or catching up on your teams. We promise to knock the ball out of the park with our convenient hours and no appointment policy, plus reasonable prices that make you a fan. Whatever type of style you are looking for, Head Coach Haircut's experienced stylists are ready to help you get the look you desire. They are ready and highly trained to give you helpful tips if you are looking to try something new. Our adult male clients also receive a relaxing shoulder massage, steamed hot towel, and massaging shampoo and conditioner with each haircut. Head Coach is now pleased to offer barbering services at all 3 locations. Come by and see one of our Master Hair Care Specialists who offer straight razor face, neck, and head shaves. Head Coach Haircuts has three convenient upstate locations in Greenville, Taylors, and Simpsonville. Come relax with us, root on your favorite team, and get a great cut - every time. We don't accept appointments, please walk in anytime!